News : Our main news page (look for Tower bridge icon) London Evening Standard BBC. There are few things that the former London Mayor, Ken Livingstone, did that attracted so much attention or mythology as the creation of the London "Congestion Charge" with a toll of �payable by any vehicle that moved within the centre of the city. The scheme started on 17 February 2003, with the toll increasing to �in July 2005 and the area being doubled with the "Western extension" in February 2007. The scheme was not a world first as there were already similar schemes in Singapore (electronic from 1998) and Norway (the first starting in 1991). There was even a scheme in England - at Durham - though that scheme only applies to only one street! Among the claims that were repeated by environmental campaigners all round the world were that the toll reduced congestion, improved air quality, raised substantial amounts of additional revenue and did all this without harming businesses in the area. - None of these claims was correct. As well as the arguments as to whether tolls are fair or economic, there is also an issue about liberty - do drivers want the authorities and any snoopers who can access the system to monitor where they are? Although traffic levels were and are lower, the improvement in traffic speeds was small and by 2007 the traffic was moving as painfully slow as it did before. The improvement is air quality was theoretical only, as no improvement can be detected. The substantial costs of implementing the scheme and then of running and trying to enforce it with many drivers trying to evade payment meant that there was relatively little profit compared with the billions that are already spent on public transport in London. Though the Mayor's staff claimed that businesses had not been hurt that was not the view of many businesses particularly shops and restaurants. In May 2008 a new Mayor, Boris Johnson, was elected. The old Mayor lost partly because of the issue of the Congestion charge, as the Tory candidate for Mayor had promised that if elected he would consult the people affected and that he would remove the western half of the toll zone if that was what people wanted. In what may well be a first for British politics the new Mayor kept his promise and in November 2008 announced that the Western half of the zone would be removed, though there will be a very long delay before various legal formalities are complete. In the meantime many businesses and Hammersmith and Fulham Council called for the Mayor to use his emergency powers to end the charges immediately. The Mayor has ignored these requests and there is a suspicion that he will not after all honour his promise to remove the western extension. Some groups had suggested to the new Mayor that the pain inflicted by the scheme on people and businesses could have been reduced by changing the hours etc., but opponents argued that more radical surgery was needed. It was also suggested that a more sophisticated scheme, similar to Singapore's, with tags and beacons could and still should be introduced. But the evidence is that the main effect of such schemes is to cause even more annoyance to drivers and businesses. Also as many drivers are currently not paying the London charge, there was also the problem that you would still need the present system as a back up to catch drivers without tags. So a more sophisticated system could prove to be even more expensive than the old one. The decision of the Mayor was a relief to businesses in the Western zone (though too late to stop some from closing), but was a blow to those who see the answer to the world's population problem as more regulation of drivers and more taxes and in particular toll schemes. 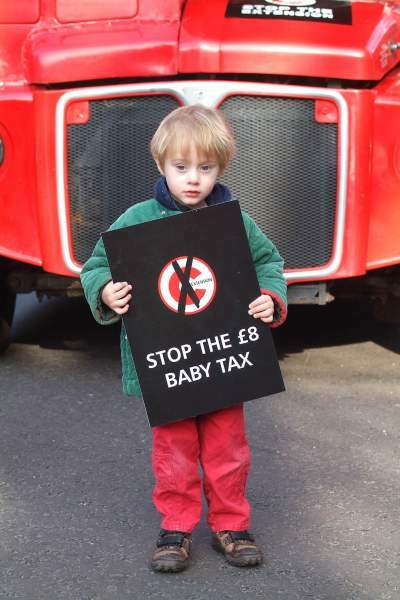 Link: A summary that we did in July 2009 of the resaons why we oppose "congestion charging"
The original London zone with a charge of five pounds came into force on Monday 17th February 2003. 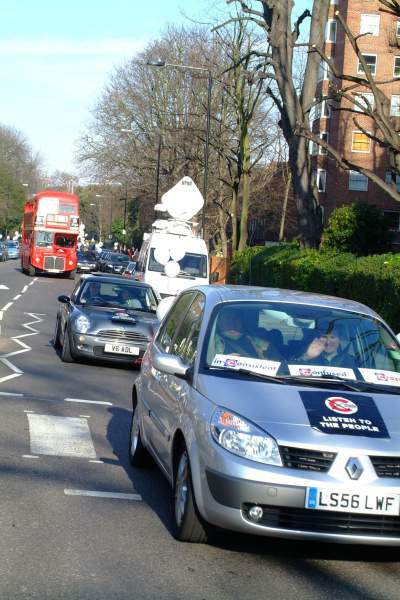 A day chosen as the schools were on holiday and traffic would be less - BBC - "Congestion charge comes into force". The charge was increased from five pounds to eight pounds on Monday 4th July 2005 - BBC - "Congestion charge increases to �. The charge is payable on the day the vehicle is in the zone, otherwise there is a very high additional penalty charge. But from Monday 19 June 2006 this arrangement was changed, so that the charge can be paid either at the eight pounds rate on the day or at a ten pounds rate until midnight on the following day. The London scheme applies to vehicles driving within the Zone. But drivers living within the Zone get a 90% discount. 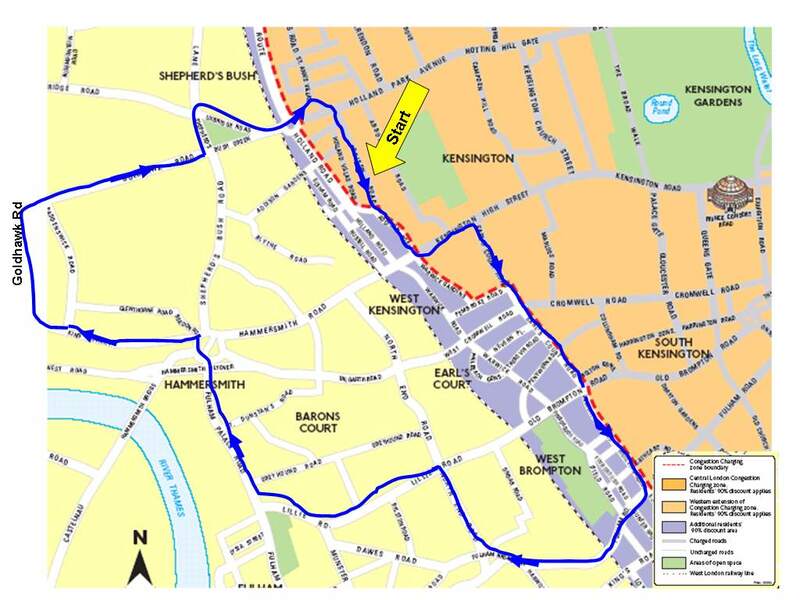 (The residents discount can also be claimed by those in a few small areas on the western fringe which are outside the zone - the effect of this is that all the residents of the borough of Kensington & Chelsea qualify for a discount.) So almost all the tolls comes from those entering the zone each day. The charge is payable online, at pay stations, by text, or through the call centre - TfL - "How to pay". The difficulty in paying the charge and the risk that you either forget or make a mistake (such as getting your registration number wrong) was a deliberate part of the scheme - as it further discouraged drivers from entering the zone. The "new" Mayor has said that he will make the charge easier to pay - an indication that like 90% of other Londoners he realises that the scheme does nothing to improve traffic speeds and hopes to raise as much money as he can from it. There are high penalties if the charge is paid late. The penalty charge if the penalty charge notice (PCN) is paid within 14 days is in effect (due to a "discount") sixty pounds; between 14 days and 28 days it is one hundred and twenty pounds; and after that it is one hundred and eighty pounds, though in practice it may end up being much higher due to bailiff's fees and the driver may have their car appropriated. TfL - "Penalties and enforcement". There is an appeal process, but very few drivers manage to successfully challenge the PCN. Despite the charges and penalties there are large numbers of people who avoid payment by various means - BBC July 2009 - "C-charge dodgers owe London �m". Note that this may be the tip of the iceberg. The zone was extended (after a consultation which the Mayor ignored) to the western side of the Inner Ring Road on Monday 19th February 2007 - BBC - "Congestion charge zone increases". Though as indicated below there is an untolled road dividing the extension from the original zone. The zone is in the central part of London but does not cover the whole of the centre. The size of the original zone was 22 square kilometres or only 1.4% of the total London area (1,579 square kilometres). The Western extension almost doubled the zone to 42 square kilometres, 2.7% of London. It is probable that the Mayor's ultimate aim was to cover 100% of London. Traffic could drive round the original Toll Zone using the Inner Ring Road, which is a complete loop and formed the boundary. Following the Western extension, the "zone" is split by a free corridor down the middle (between the original zone and the extension) - along Edgeware Road, Park Lane, Grosvenor Place, Vauxhall Bridge Road and across the Thames. It is also possible to drive through the north west corner without "entering" the zone. Transport for London maps of the zone. Note the two free corridors marked on the maps. With the current charge there are about 100,000 vehicles a day that pay to drive within the London Zone together with a considerable number that are exempt or partly exempt from the charge. The number of cars entering the London zone initially fell by about 30%, and is still down. Other traffic increased. There are no comprehensive figures for what has happened outside the London Zone, and opinions differ as to whether it is better or worse. But the fall in cars entering the zone only resulted in a small increase in traffic speeds and by 2007 traffic speeds were down to the figure before the charge was introduced. Much of the traffic, particularly buses, taxis, motor bikes, and cycles pays no charge and they fill up the vacated road space. The charge is a flat one. The drivers who would have spent the least amount of time in the zone will be the most deterred. The drivers who spent the most amount of time travelling in the zone will the least deterred. Some drivers may drive around more to get better "value" from the charge that they have already incurred. Those who are resident in the zone, get a substantial discount, so each time the zone is extended there will be more cars who can enter older charge areas for "free". People who advocate tolls are the samne ones who try and restrict, slow and stop traffic. So if traffic speeds improve, then they will take steps to make things worse. There are various sources for financial figures. None of them give much detail, they are not consistent and in the main they ignore the cost of setting up the schemes. One source is the TfL - "Congestion Charge Four Year Programme" pdf published in December 2006. This shows the scheme as making a �3 million profit up to March 2006, incuding a profit in the first year. But the figures exclude all of the setting up costs and various indirect costs. Another source is the Impact monitoring reports - TfL - Links to all reports. Their basis is similiar to the Four Year Programme but they show more detail of the income. One problem is that the reports do not cover income in the first two years. Another problem is that bad debts are treated differently between these monitoring reports (where they reduce income) and the TfL accounts (where they are included in expenditure). The most reliable source is the TfL published accounts - TfL - Links to all Annual reports and Statements of accounts. The main problem with these is that they show almost no detail. Another problem is that they do not include the costs of setting up the scheme apart from a small part of the set up costs of the western extension and some insignificant charges for capital. The figures that follow are based on all the above sources and answers to Freedom of Information requests made by us. Up to the end of March 2009 the total income due from drivers was nearly 1.6 billion pounds, including 650 million pounds of penalties. Bad debt provisions were nearly 250 million pounds, so the amount expected to be collected was 1.35 billion pounds. The cost of setting up the scheme and collecting the charges was just under one billion pounds, leaving a profit of about 370 million pounds. Up to March 2009 it had cost 72 pence to collect each one pound of income (charges and penalties). Penalties make up 41% of the income, so without them the scheme would make a loss. As at March 2009, the balance on the Bad Debts provision was �6.4 million. As the contributions to the provision have totalled �6 million, this implies that debts of �0 million have been written off completely. 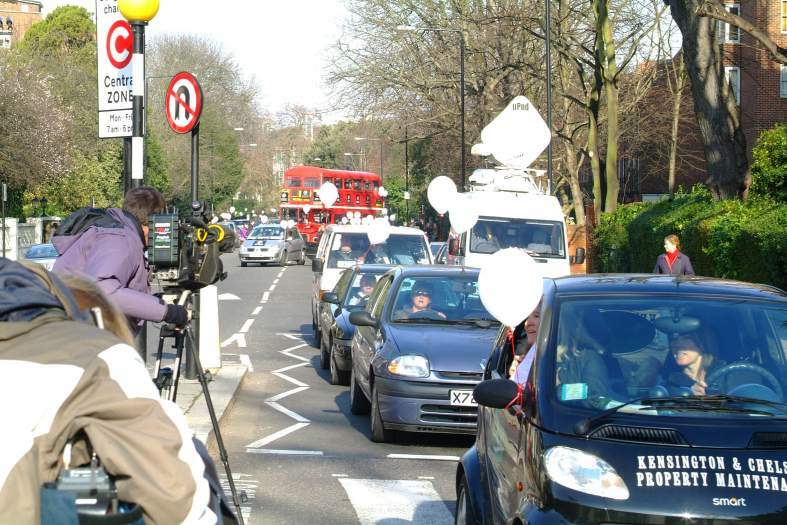 The above figures for the Congestion Charge zone exclude the Low Emission Zone which was introduced on 4 February 2008 - BBC - "Motorists enter the emission zone". There are no identifiable figures for the LEZ in the TfL accounts, but in answer to a Freedom of Information request we have been told that in 2007/08 the expenditure was �3 million with income of �5 million, and in 2008/09 the expenditure was �8 million and the income was �4 million. The TfL figures appear to exclude most of the costs of setting up the zone. A considerable amount of information is available as Transport for London have since June 2003 issued various reports on the impact of the Congestion Scheme in London - TfL - Links to all the reports. Unfortunately all of this information comes from TfL who have a vested interest in portraying the scheme as a success. Also despite the large amount of information that is available there is much that would be relevant but is not available, either because TfL have not published it or because it was never collected. When we were campaigning against the Edinburgh "Congestion" Charge we did an Analysis of the Jan 2005 report. Others have analysed more recent reports, including - ABD Analysis of the July 2007 TfL report. One of the controversial areas is the impact of the charge on businesses within the zone. There are businesses who support the London charges, perhaps they use taxis a lot! Most businesses, however, seem to oppose the charges and in particular those businesses within the Charge Zone who depend on "footfall" i.e. shops, and restaurants. London Chamber of Commerce and Industry Third Retail Report on the effect of the charge on the Retail Sector was published in January 2005. It made gloomy reading. The Executive Summary on page 5 included:- 1. 84% of respondents reported a fall in taking since the charge was introduced. 2. 63% of respondents reported a fall in customer numbers since the charge was introduced. 7. 37% of retailers have reduced their staffing levels since the introduction of congestion charging. 28% are considering closing their business as a direct result of congestion charging. The effect of the charge on the restaurant trade was also surveyed by the London Chamber. The following report (September 2004) was not quite as gloomy as the retail survey, but still grim. 2. Nearly 80% of respondents reported a fall in customer numbers since the charge was introduced. 6. 43% of respondents have reduced their staffing levels since the introduction of congestion charging. 8. 20% are considering closing their business as a direct result of congestion charging. More recently the Chamber in their "London Business Manifesto 2008" (pdf) said (page 9) that "The congestion charge has had a negative impact on the local economy in both the original central charging zone and the more recent Western Extension Zone (WEZ)." They called for "An urgent, independent and comprehensive review" and changes to the scheme. The Forum of Private Business also believe that tolls and congestion charges harm businesses. They have had a petition against the London charge and also campaigned against the Western extension. The London Mayor proposed a westward extension of the zone. There was a consultation exercise which showed that almost no one wanted the extension. The Mayor did it anyway, and the new zone came into operation on Monday 19th February 2007 - 4 years after the original zone started. 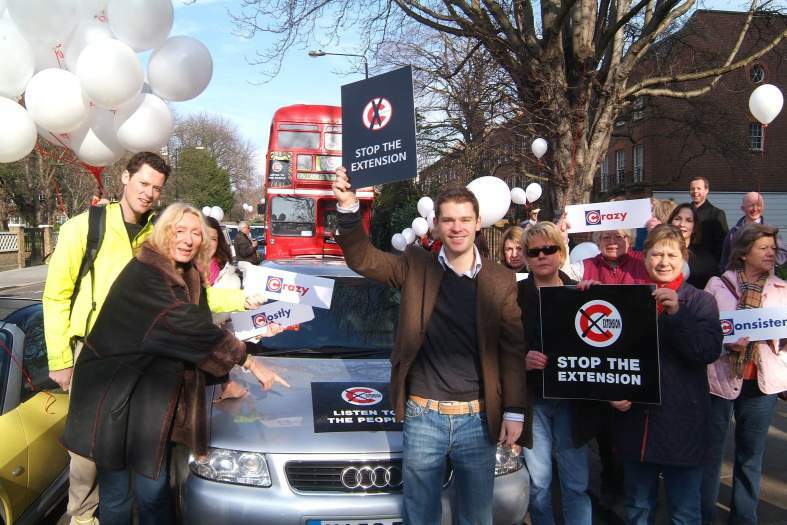 Opposition to the extension was led by the West London Residents Association - WLRA details and a summary of what they had done as at August 2006 WLRA "The London Congestion Charge - The Road to Failure" - February 2007. Protest just before the extension took effect - A "go slow" drive on Saturday morning 17th February 2007 starting at Addison Road was organised by the WLRA and others. It assembled in Addison Road, Kensington, the route was - Head south through Earls Court, Right in to Fulham Road, Through Fulham Broadway, Right in to North End Road, Left at Lillie Road Roundabout, Right in to Fulham Palace Road, Round the Broadway in to King St, Right into Goldhawk Road and through to Shepherd's Bush Green, Over the roundabout at the start of the West Cross Route and in to Holland Park Ave, Left in to Royal Crescent - around and back down into Addison Road and disperse. There was also a march on foot on the morning of Monday 19th February 2007 down Walton Street in Chelsea. Some pictures taken by Pete Law photographer - Pic 1 Pic 2 Pic 3 Pic 4. Details of both protests - pdf version Details of both protests - Word version Map of go slow route. Boris Johnson has said that he will remove the Western extension - Mayor's press release 27 November 2008. But it remains to be seen whether he will be able to overcome likely obstruction fron the TfL bureaucracy. This was our submission to the summer 2010 consulation on removing the charge. Earlier this year I asked you to intercede on my behalf to prevent your Enforcement Officer upholding the issue of a Penalty Charge Notice against me. I wrote to you again asking that you show some semblance of a democratic impulse, human decency and sense of justice. Eventually I received a reply on your behalf telling me that TfL must act with fairness and consistency but warning me that appeals do not accept unwitting entrance into the Congestion Zone as a mitigating factor. That your office sees no blatant contradiction between the two statements is a sad indictment of the level of rational thought that lies at the heart of this authoritarian and monstrously unjust scheme. Your office claims that the signage for the zone enables motorists to anticipate it and change direction if they so choose. This is not so. The signage is designed to corral them into the zone's revenue-raising area. It's sheer greed that will be the undoing of this scheme. You've underestimated the intelligence of the public you are supposed to serve and I intend to challenge the legality of this scheme . I wonder what the visitors from UK and overseas arriving for the 2012 Olympic Games will think of all this? Association of British Drivers - "London Con Charge"
Pierre Lemieux - Surveillance & Tolls. Safe Speed - "Why it's wrong and why it won't work Or: how to burn money and attack the poor"